Manufacturer of a wide range of products which include chopped strands and fiberglass chopped strand. Chopped strand also known as CSM, is made up of 6-50MM long fiberglass strands that are randomly oriented and typically held together with a styrene-soluble binder that acts like glue connecting the fibers. The binder is designed to dissolve upon contact with styrene in polyester resin or vinylester resin. 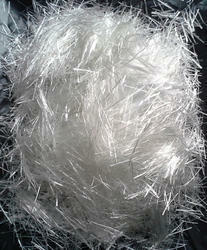 We are offering Fiberglass Chopped Strand.